Jump easily to various tasks, such as Check Writing, Reports, Backups, Rent Posting, or to your Owner, Property, Unit, and Tenant Information! 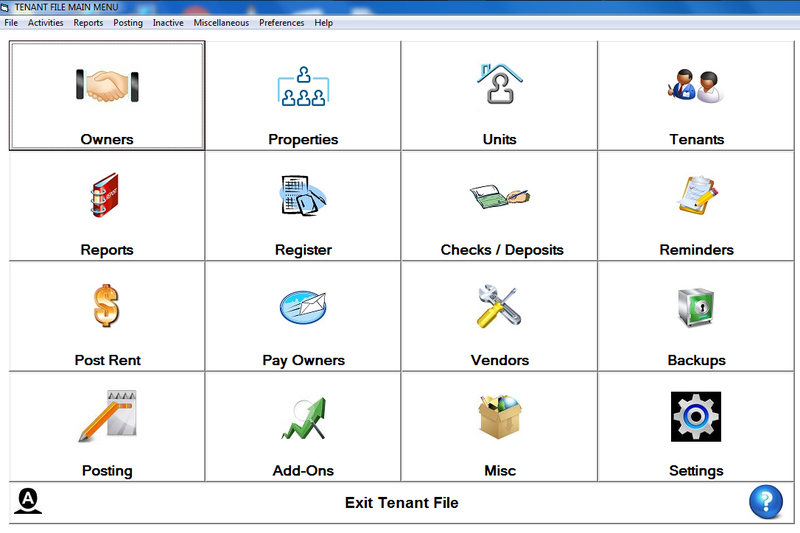 All of the main tasks that you use in the Tenant File are at your fingertips. You can access the Owners, Properties, Units and Tenants with a single click. The Report Screen is just a click away and all reports can be run with just a couple of clicks. If you want to write a check or view your check Register, again it is just a click away. To charge rent to your Tenants, it literally takes, 2 clicks of the mouse, even for hundreds of tenants! Paying your owners takes seconds and making a backup of your main database file is only two clicks. Never has there been a powerful rental management system this easy. Other less used selections can be accessed from the Tenant File menu system above the buttons. All items are logically arranged and easy to access. No searching through complicated menu systems. Just drop down the selections and make your choice. For example, under the Posting menu selection, you can check for DirectPAY payments (if DirectPAY is set up), charge Special Rent Charges (such as weekly rent), post CAM charges or post other items automatically. Under the Help section you can access the entire searchable Tenant File Users' Guide. By choosing Help > Web Support you can visit our support web page and contact us directly with a single click. Also, from the File menu, you can access the Tenant File Options, such as the Word Processor with 150+ property management forms, the easy to use Tenant File Work Order Program, and the RentalWIZ service to upload your vacancies to the Internet. Plus you can run tenant screening from within the Tenant File program. We have listened to our customers and worked hard to prove a navigation system that is intuitive, easy to use, and gets you where you want to go - fast!